Clean air superhero Oxy Gene will lead a Double Tall bus in the Strawberry Festival Parade Saturday, June 16th, in Marysville. Photo courtesy of Community Transit. 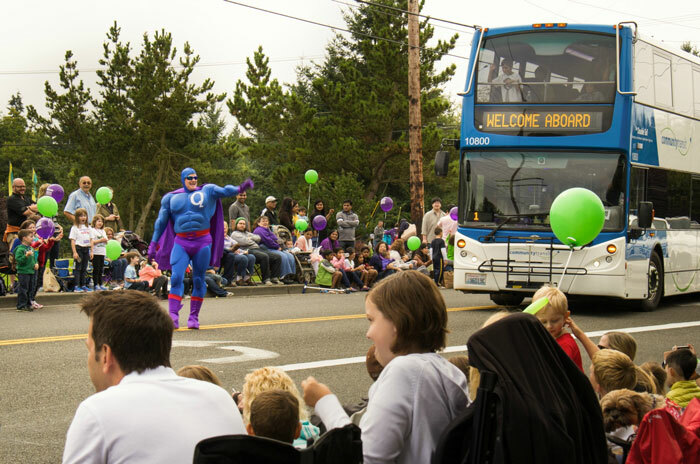 Clean air superhero Oxy Gene will lead a Double Tall bus in the Strawberry Festival Parade at 7:45 pm on Saturday, June 16, 2018, in Marysville. On Sunday, June 24th, a Community Transit Double Tall bus will make its way to Seattle Center in the colorful Seattle Pride Parade. These are just some of the events Community Transit will be at this summer to spread the word about expanding bus service and new employment opportunities. In particular, Community Transit staff will participate in events along the Swift Green Line corridor from Bothell to Boeing to answer questions about that service, which will start in spring 2019. Visit www.communitytransit.org/events to see all events. Community Transit continues to hire more bus drivers, mechanics and administrative staff to support its service expansion. Employment positions are listed online at www.communitytransit.org/jobs. Oxy Gene and the agency’s popular Double Tall double-decker bus will travel down State Avenue in Marysville Saturday night, June 16, in the Strawberry Festival Grand Parade. The parade starts at 7:45 p.m. at 76th Street NE and State Avenue. The parade procession travels south on State Avenue then turns east on Third Street and ends at Alder Avenue. Staff will have a table at the Mill Creek Farmer’s Market from Noon to 5 p.m. Friday, June 29. The event takes place in the parking lot of Mill Creek City Hall North, 15720 Main Street. A Double Tall bus will run in the Seattle Pride Parade, which starts at 11 a.m. at Fourth and Union in downtown Seattle. Staff will have a table at PrideFest at Seattle Center from Noon to 6 p.m.
See a Swift bus up close and ask your questions about the service during the Mill Creek Festival. We will be at the Mill Creek Town Center Saturday from 11 a.m. to 6 p.m. and Sunday from 11 a.m. to 5 p.m.
Oxy Gene and a Swift bus will be at Willis Tucker Park in Snohomish at 7:30 p.m. before the 9:18 p.m. outdoor showing of The Greatest Showman. Oxy Gene will take a Community Transit bus to Gold Bar’s Gold Dust Days Parade. The parade runs on Main Street starting at 10 a.m.
Oxy Gene and a Double Tall bus will line up at 11 a.m. for the Stanwood Camano Parade along the Pioneer Hwy. Oxy Gene and a Swift bus will be at Willis Tucker Park in Snohomish, 5 to 8 p.m.
Oxy Gene will throw out the first pitch for the Aquasox game at 7:05 p.m. at Everett Memorial Stadium. A Swift bus will be at Bothell City Hall for the city’s annual Sustainamania event celebrating all things good for the environment, including transit! A Community Transit table will be at the event from 10 a.m. to 2 p.m. Climb aboard a Double Tall bus at Lynnwood’s annual Fair on 44th. Community Transit will be at the event from 10 a.m. to 2 p.m. at 44th Ave W (between Lynnwood Library and Fire Station #15). Oxy Gene will lead a Swift bus and a delegation of veterans from Community Transit’s employee ranks marching in the Mill Creek Veterans Day Parade. The parade starts at 11 a.m. at Mill Creek Town Center.